e-Meters or e-Hackers? Sustainable Cowboys or Welfare Ranchers of the American West? Most people in our vaccine-overloaded society knows of one or more families that have one or more children with chronic, supposedly incurable (but probably preventable) diseases that will need lifelong, regular, costly physician “management” and the highly probable use of potentially toxic, costly, synthetic, possibly dependency-inducing medications that can cause additional prescription drug-induced illnesses (that may further sicken the already-ill children). The following peer-reviewed article convincingly implicates iatrogenic vaccine-induced immune overload as a highly likely, major cause of the current epidemic of chronic illnesses of childhood (and adulthood?) 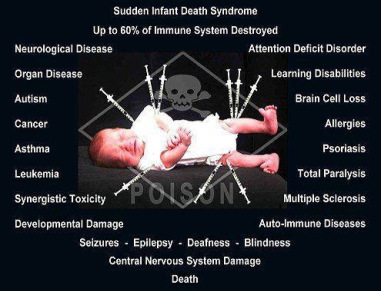 that has paralleled the enormous increase of childhood vaccinations over the past several decades – which have a variety of known cellular toxins in them (such as mercury, aluminum, formaldehyde, MSG, neomycin, gentamycin, streptomycin, polymyxin B, polyethylene glycol (antifreeze), squalene, killed and/or live viruses, viral contaminants (some of which are carcinogenic), etc). and metabolic syndrome (= obesity, type 2 diabetes/insulin resistance, hypertension, and dyslipidemia). J. Barthelow Classen, MD, immunologist and the author of the present study says “since 1999 the routine pediatric immunization schedule has increased by 80 vaccines” (that number counts each strain of antigenic virus or bacteria that have been included in the new inoculants). Classen believes that “the sum of the data described and reviewed in this paper supports a causal relationship”. From the perspective of the tens of thousands of parents (since the “age of autism” began just just a few decades ago) who know for certain that their previously happy, developmentally normal infants were sickened shortly after routine vaccinations, Dr Classen’s powerful scientific research cannot be discounted, even with the expected media blitz that is expected from Big Pharma, the AMA, the American Academy of Pediatrics, the AAFP, the CDC, the WHO and the various trade organizations that profit so mightily from the vaccine industry. There has been an epidemic of inflammatory diseases that has paralleled the epidemic on iatrogenic immune stimulation with vaccines. Extensive evidence links vaccine induced immune over load with the epidemic of type 1 diabetes. More recent data indicates that obesity, type 2 diabetes and other components of metabolic syndrome are highly associated with immunization and may be manifestations of the negative feedback loop of the immune system reacting to the immune overload. The epidemic of diabetes/pre-diabetes appears to be accelerating at a time when the prevalence of obesity has stabilized, indicating that the negative feedback system of the immune system has been over whelmed. The theory of vaccine induced immune overload can explain the key observations that have confounded many competing hypotheses. The current paper reviews the evidence that vaccine induced immune overload explains the disconnect between the increase in pre-diabetes and nonalcoholic fatty liver at a time when the obesity epidemic is waning in children. influenza (3 valent per year x 18 years=54).